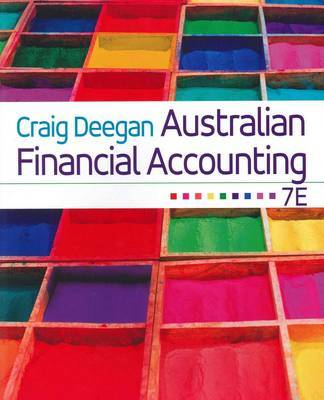 Clear, direct and comprehensive, Australian Financial Accounting is the market-leading text in financial accounting. Craig Deegan successfully communicates the detail necessary to understand and evaluate financial reporting. This edition is fully updated and provides students with the best foundation for their studies and future profession. New to this edition: Additional end of chapter exercises. Coverage of ongoing changes in the convergence of IASB and the US Financial Accounting Standards Board New material detailing how the financial crisis affected other international central banks Extensive revision of the chapter on Accounting for Financial Instruments. Inclusion of new international projects and standards and entirely new worked standards illustrating changes to practice.